Kenosha County currently operates a tower for public safety communication purposes on the property at 5406 – 60th Street. This property is now the Kenosha Commons Apartments, formerly the Kenosha County Highway Department Garage site. That tower needs replacement in the near future and the County wants to locate a tower of similar or taller height in the same vicinity. An engineering study was done in December of last year, and the results were received in January, which showed that the tower has reached the end of its useful life, which is about 75 years, according to Arbet. He said that they had to look for another piece of municipally-owned piece of property on which to build a new tower. The site chosen was a few blocks west of the current tower, in Nash Park, abutting 60th Street. The current tower is 295 feet in height, and the new tower will be 316 feet in height. The added height is needed to boost the emergency communications for the three departments. The new tower will be in excess of 300 feet, which is not permitted by the city’s zoning ordinance. The Airport Height Map also restricts height of buildings and structures within three miles of the airport. A tower in excess of 300 feet in the vicinity of the existing tower would not comply with the restrictions of the Airport Height Map. Arbet replied that an area behind Shop-Ko was also being considered (52nd Avenue and 51st Street), but it was ruled out due to its lower elevation and the added cost of fiber. The number one choice is the Nash Park site. 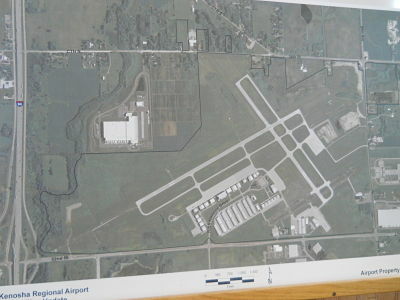 The Federal Aviation Administration (FAA) also needs to give their approval because the tower sits within five miles of the airport. The FAA needs to make sure that the tower will provide no hazard to navigation. The FAA approval is being sought concurrently with the approval request for the Kenosha zoning ordinance change so as to save time. Arbet said that the request for proposal (RFP) specifications for the tower and the support building will go out next week, and they are looking to get the footings (foundations) in before November 15. The goal is to construct the tower before the end of the year. The application was filed with the FAA sixty days ago. Last week, they heard back from them, and they said that a letter of circularization needed to be sent to local airports and local pilots to make sure that there were no negative things. The investigation should be concluded by the end of September. The tower is essential for public safety communication purposes. Therefore, the city drafted the zoning ordinance to create a conditional use permit for public safety communication towers and antennas. The conditional use would be allowed in B-2, Community Business, M-1, Light Manufacturing, M-2, Heavy Manufacturing, and IP, Institutional Park Zoning Districts. The height would be established by the Common Council as the review authority. There is also a proposed exception procedure for the airport height limit. The FAA would have to approve the exception to the height limit before the city can approve an exception. The Airport Commission would also review the exception request. This conditional use permit would be strictly for towers utilized for public safety communications. Commercial use of the tower, such as cellular antennas or wireless internet services will be strictly prohibited. “Tonight’s approval merely changed the zoning ordinance to allow for the added height for the communication towers, and to provide a means to handle exceptions,” said development coordinator Brian Wilke. The request for the conditional use permit will need to come before the commission, then be approved by the Common Council.